JMU employee Robert Smith has claimed a prize in the prestigious international photography competition, the Insight Astronomy Photographer of the Year, with an image obtained from the Liverpool Telescope. This composite of two images obtained with the Liverpool Telescope compares slit-less spectroscopy of two well known planetary nebulae, NGC6543 (Cat’s Eye Nebula) at the top, and NGC6720 (M57 Ring Nebula) below. 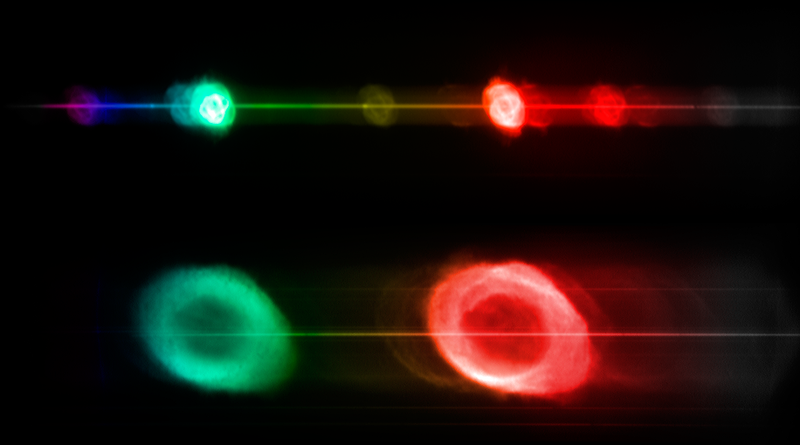 In a spectrograph the light is dispersed into its constituent colours. If a target emits light at all wavelengths (such as the star at the centre of each nebula) then it is transformed into a horizontal line and all those colours add up to appear white to our eyes. Planetary nebulae, such as these, only emit light at very specific individual wavelengths. Each of the emission lines creates a separate image in the instrument. A normal image of the nebula is thus decomposed into its individual constituent colours. The particular wavelengths a nebula emits identify the gases of which it consists. Here, the brightest emissions are the red hydrogen-alpha and green oxygen-III lines. The observations were obtained robotically using the Liverpool Telescope and the SPRAT spectrograph which was built by a current LJMU PhD student, Andrzej S. Piascik. All the data used are publicly available from the LT data archive. Insight Astronomy Photographer of the Year 2016, attracted over 4500 entries from 80 countries and all seven continents. This year saw the annual competition's first entry from Antarctica! The prizewinners were announced during a ceremony at the Royal Observatory Greenwich with the Liverpool Telescope image, “Iridis”, taking first place in the “Robotic Scope” category. The winning images offer a fascinating cross section of everything that can be considered astrophotography, encompassing pictorial landscape, views through powerful telescopes, highly technical image processing and even social commentary. Creator of the "Iridis" image, Robert Smith, says he was inspired to create it when considering the idea of ‘science as art’. We often hear about the idea of representing scientific data in an appealing way as an expression of art, but why not look at it the other way around; ‘art as acience’? Astrophotography is not just a matter of making science look pretty, it shows us that beauty actually is science. The winners of this competition were obviously selected because they were beautiful, striking or interesting, but each and every one is also an expression of astrophysical processes and could be the basis of a science seminar in their own right. It is physics that creates that beauty. Looking at the swirling gas in a nebula or the aurorae, you are literally seeing maths and physics. All the winning entries may be seen in a free exhibition at the Royal Observatory in Greenwich which runs until June next year and in the Insight Astronomy Photographer of the Year 2016 show, available to planetaria worldwide. Quite apart from seeing the Liverpool Telescope's contribution, a visit to the exhibition is very much worth while if you are near Greenwich over the next year. All the winners and short listed entries are absolutely spectacular and inspiring both in their artistry and science. 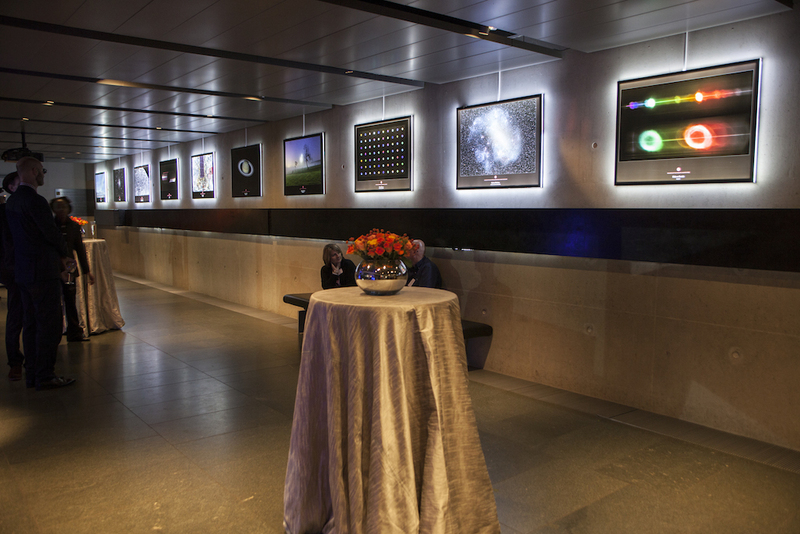 "Iridis" among the exhibition of winning entries on display at the Royal Observatory Greenwich.